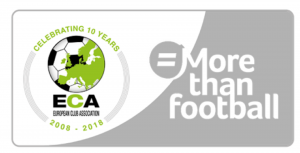 We are pleased to announce that the European Club Association (ECA) will take part in the #Morethanfootball Action Week from 30th March until 09th of April 2017. The ECA is the sole, independent body directly representing football clubs at European level. It exists to directly represent football clubs and safeguard and promote their interests on European club football matters. However, the ECA does not purely see it as their mission to represent clubs and cooperate with European football stakeholders. It is also one of the Association’s priorities to offer a variety of information and knowledge sharing on European football matters, which add a value to its member clubs. The knowledge includes research in the area of Community and Social Responsibility. ECA takes CSR seriously and is fully aware of the responsibility its members have towards their local communities and society as a whole. Therefore, the Association is encouraging all clubs to be active in CSR and promote these activities as a whole among its member clubs. In order to stimulate clubs to undertake Community and Social Responsibility initiatives, ECA has published a collection of ECA Member Clubs CSR projects as a best practice handbook. The handbook offers examples to sport clubs to undertake similar initiatives since the ECA believes that CSR in football can make a real and lasting difference in communities, regardless of club’s size and budget. Throughout all activities, ECA aims to be constructive and challenging in order to really deliver results that follow the motto “Leading the Way for Football Clubs in Europe”. We are looking forward to a successful cooperation with the ECA during the #Morethanfootball Action Week.